Consuming water in the morning hours is a regular practice of most Japanese women of all ages. And each and every time you think about ladies from Japan the picture that shows up in your mind is a petite svelte lady, correct? This is not uncommon due to the fact that women from Japan with excess weight issues are hard to find indeed. In the last couple of years, through listening and studying about the Japanese tradition, we have come to the realization that Japanese folks have a different kind of diet regime in a lot of regards. Particularly, they also have a different way of life and every day regimein comparison with the greater part of the Western world, where individuals are regularly dealing with excess weight challenges. Perhaps this is due to the fact that humans seem to have lost their ‘thirst sensation’ and the critical perception of the need to drink more water. So, the body’s biological thirst signals can be mistaken for signs and symptoms of other illnesses. What is the best way to hydrate your body? 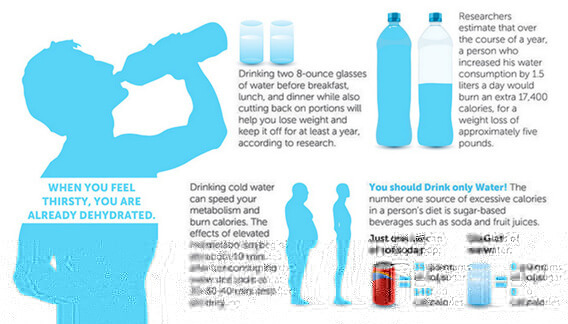 How much water should you drink? Since Japanese people seem to have fewer problems than we do, we are going to reveal a ‘water delivery secret’ of theirs, and try to apply it to our everyday lives in order to reap water benefits and improve our general health. How much water to drink throughout the day? Water intake should start right after you get up as the first drink on an empty stomach. It is one of the things the Japanese never forget to do first thing in the morning! Having plain water is a very effective healing routine since it creates a stimulating environment inside the body for preventing numerous diseases by way of flushing out toxins. Scientists have studied this seemingly insignificant “morning ritual” and have unanimously come to the conclusion that water on an empty stomach eases all the health problems mentioned above. It also improves the general condition of the eyes and helps with uterine diseases (especially menstrual disorders). Each morning when you wake up and get out of bed, the very first thing you should do is drink about 640 ml (21 oz.) of water. If you manage to use this Japanese practice, after a certain period of time, you will begin to notice the first signs of improvement of your health parameters. You will also start feeling much more energetic and sturdier than you used to be. As for how long should this “water therapy” last, the answer is: It depends on the kind of health problems you are beset with! • If you are suffering from gastritis, continue your water therapy for 10 days. • In case of constipation, you need 10 days of water drinking in the morning. • Diabetic patients need 30 days of morning water drinking. • High blood pressure takes 30 days to get back to normal readings. • Patients with tuberculosis should have this morning drinking for 90 days. Once you have successfully introduced this “therapy” into your everyday routine, and felt the positive results of course, you should try to maintain it as long as possible. And it goes without saying that the better the quality of water you consume, the better the results you will experience from water therapy. Note: An exception should be made for those who are diagnosed with arthritis. They should apply it only for the first 3 days of the first week. In the following period (starting from the second week) they should do it regularly, every day of the week, just like all the others. See also: He Decided To Drink A Gallon Of Water A Day For 30 Days. The Results Are Shocking! Drink before you eat. Water is an appetite suppressant, so drinking it before meals can make you feel fuller and therefore reduce your usual food intake. Replace calorie-filled drinks with water. Drink ice cold water, especially in the summer. Hit the gym with loads of water in your backpack. Make sure you get just enough food so as not to feel hungry. 1. Did you know water can make you smarter? While you may not know it, dehydration can reduce your ability to focus and concentrate on completing intellectual tasks. In fact, a study, done by the University of East London, states that a simple glass of water can help boost brain function by 14%. The researchers think the water helped by freeing up the parts of the brain that were busy ‘telling’ the body it was thirsty. 2. Are you moody and tired more often than not? The answer is – you just might be dehydrated. Water has a bigger impact on our bodies than just quenching our thirst. When we do not drink enough water, we can quickly become dehydrated, which can have a negative impact on our mood, energy levels and our capability to think clearly. Researchers at the University of Connecticut’s Human Performance Laboratory discovered that even mild dehydration can cause people to feel anxious, tense or tired, affecting their ability to perform cognitive tasks and cope with stress during the day. 3. Water helps you look and feel your best. Do you want to get in the best shape of your life? Water can help you reach your health and weight loss goals. Not only does it act as a natural appetite suppressant by helping you feel full faster, but also a great number of studies have shown that drinking a glass of cold water when you wake up in the morning speeds up your metabolism. It even keeps your skin looking young and healthy by helping reduce those fine lines of wrinkles around your eyes [that can be caused by dehydration]. 4. Drinking plenty of water can save your heart. Not only does water help you look healthy on the outside, but it also protects the most important ‘pumping organ’ in your body as well—your heart. According to a study done over the span of 6 years, those who drank at least 5 glasses of water per day were 41% less likely to suffer from a heart attack than those who drank only 2 glasses of water (or less) each day. TO SUM UP: If you want to look, feel and function your best, make sure you drink enough water throughout the day. If drinking this much water is a challenge for you, check out other blog posts for helpful tips. You may discover new ways to drink more water that you might not have even heard of before!